If you have never come across or heard of the molybdenum mineral, you are not alone. The Molybdenum mineral is one of the family of trace minerals and although the body stores this mineral in most body tissues including the brain, liver, spleen, lungs, kidneys, bones and skin, the actual levels within the body are not very significant. 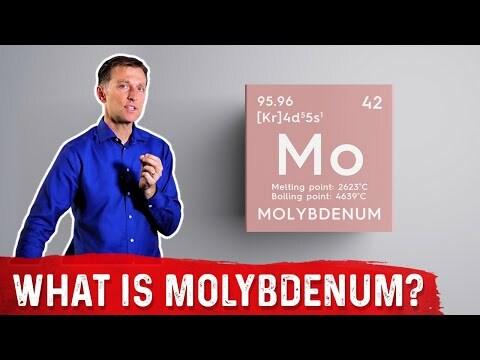 What is Molybdenum & its Benefits? Molybdenum is a component of the enzymes xanthine oxidarse, aldehyde oxidase and sulfite oxidase. As you might guess from the name, molybdenum helps to break apart the sulfite toxins that build up inside the body. That is one reason why it is believed to have antioxidant characteristics. Sulfites in the body are common because they are regularly included in chemical preservatives. Certain foods and drugs and even protein-rich foods also contain sulfites. When the body is not able to break apart the sulfites that build up, it may react by triggering an allergic reaction. Like many of the other minerals, molybdenum is necessary to the body's ability to carry out the metabolization of fats, carbohydrates, copper and nitrogen. It also makes up part of the enzymes responsible for metabolizing purines and Sulphur. In fact, molybdenum is needed to produce many different enzymes. Cells need molybdenum in order to function properly. In addition, this mineral helps the body fight off nitrosamines which have been linked to cancer development. Molybdenum helps keep a person alert and it can help keep impotence from becoming an issue. It plays a crucial role in the body's ability to keep blood sugar levels in balance. And finally, it is believed that this mineral helps in the fight against dental cavities and tooth decay. Once this mineral enters the gastrointestinal tract it is easily absorbed and easily eliminated via the kidneys. Beans, dark green leafy vegetables, legumes, peas, beans, cereals, rice, yeast, whole grains, liver, kidney, low-fat milk and hard tap water (hard means the water contains a lot of minerals) are all good sources of the molybdenum mineral. Since the instances of this type of molybdenum deficiency are rare, it does not have a recommended daily allowance. However, because inadequate levels can lead to a deficiency, it is suggested that adults get 75 to 250 mcg/day. Molybdenum deficiency is extremely rare and the only real chance that one will develop is if a person consumes foods that have been grown in soils that lack this important mineral. However, this type of Molybdenum deficiency does happen and when it does, there are serious symptoms including irritability and an irregular heartbeat. A Molybdenum deficiency can cause a decrease in the amount of urine the body creates, and it can decrease the oxidation rate of fatty acids. Fatigue is another symptom as are problems associated with the mouth, gums and vision. In men, another symptom includes impotence. This type of deficiency can also cause cancer. And because molybdenum is needed to break down the sulfite levels inside the body, a lack of it can cause unwanted substances to build up which can then become harmful.